An already unpredictable season of college basketball got a little bit wackier last weekend. After defeating Georgetown, 15-seed Florida Gulf Coast has received the majority of the Cinderella-centric media coverage, and rightly so, but let’s not forget about the other two double-digit seeds in the Sweet Sixteen: 12-seed Oregon and 13-seed La Salle. The NCAA tournament hasn’t lacked for madness in recent years; this is the fourth consecutive year at least three double-digit seeds have survived into the second weekend. 2012 saw the 13-seed Ohio Bobcats advance to the round of 16. The year before featured a matchup between a No. 8 (Butler) and a No. 11 (VCU) in the Final Four, and Cornell nearly took out top-seeded Kentucky in 2010. But, with the first ever 15-seed in the Sweet Sixteen this year, is it safe to say 2013 has been the craziest of the bunch? I attempted to quantify just how wild the first weekend of each tournament has been since the field expanded to 64 teams in 1985 to see how this one compares to tournaments past. To start, I summed the seeds of all the teams that made up each year’s Sweet Sixteen, then normalized those sums into an index from 0-100, with 0 being the chalkiest possible sixteen teams (1-4 seeds in all four regions) and 100 being the “maddest” Sweet Sixteen we’ve seen so far: 1986, when the average remaining team’s seed was 5.56. 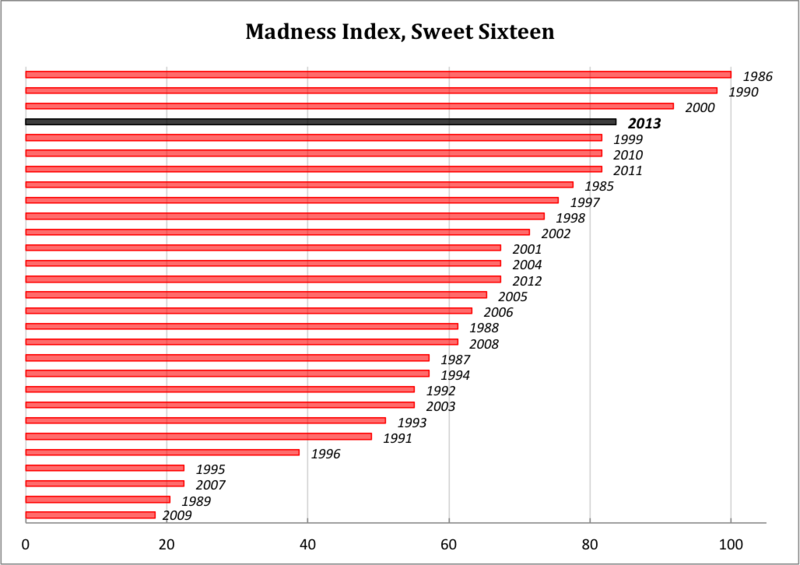 The Madness ratings for each year are graphed below. By this measure, 2013 has indeed been a particularly mad year—only three other tournaments (1986, 1990, and 2000) rank ahead of it. In 1990, only one two-seed made the Sweet Sixteen, and in 2000, two one-seeds (Arizona and Stanford) bowed out early to a pair of eight-seeds (Wisconsin and North Carolina). In addition to the aforementioned double-digit seeds still alive in this year’s tournament, No. 9 Wichita State eliminated No. 1 Gonzaga and now squares off with La Salle, ensuring the presence of at least one big underdog in the Elite Eight. In examining the graph, there doesn’t seem to be much of a chronological pattern to the Madness. The recent stretch of craziness was preceded by the most boring year in history, when, in 2009, only one team seeded higher than fifth reached the round of sixteen. And who could forget the snoozefest that was 1989, when every No. 1 and No. 2 seed survived its first two contests? This March, however, the cause of the little guy is being abundantly supported. For another week, we can revel in the improbable and urge Dunk City or La Salle deeper into the tournament. If just for images like this, let’s hope these folks keep dancin’. I wonder how this compares to other definitions of “Madness.” Oregon in the Sweet 16, for example, is very unlikely by seed, but not by better metrics. Wow, that 2000 tournament had only 5 wins by 9-16 seeds, but somehow was one of the “maddest” sweet sixteens. In the last 6 tournaments, there have been at least 11 total wins each year by 9-16 seeds. 8/12 of the top teams in the tournament didn’t make the sweet 16. Lets for a second assume that the 1 vs. 16 game is an automatic win. If all the teams in the field are identically skilled, we would then assume that 2/4 ones, 1/4 of the twos, and 1/4 of the three seeds would make the sweet 16. That’s exactly what happened. If you think about it, the fact that the top 12 teams essentially played as if there was no difference between them or any other team in the field is quite mad (if you don’t assume the 1 vs. 16 is automatic, the expected is 3/12 will make the sweet 16 and the top 12 teams only got 4/12 in which is still remarkable). Good post. I was thinking exactly what David just mentioned – maybe look at history, rank teams 1-64(5)(8), reseed accordingly, and redo this graph? Or look at betting lines so you could get total “upset quantity” measured by how much more of an upset some games really were than others, then sum for each year? Also KC_ATX makes a good point; there’s a strong argument that “madness” is progressive — that a 15-seed over 2-seed upset is worth a lot more upset value than a pair of 8-seed over 1-seed upsets taken together. Conversely, the opposite could even be true. Again, it depends on the actual perceived strength of said 1-seeds/8-seeds — for instance, in 2011 it was hard to treat Butler as a true 8-seed. But perhaps we should have? All things advanced stats/betting lines could look at more closely. Three years running may not make a trend, but that’s certainly the way to bet. In that context, one could easily conclude that Georgetown ALWAYS enters the tournament unprepared, meaning a wager on Florida Gulf Coast wasn’t exactly the longshot it appeared to be.